When you terminate an employee in CakeHR, it it not deleted but instead all of the information is kept as it was at the time of terminating. "Admin" level users can always access a list of all past employees. 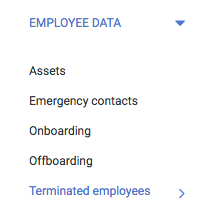 To do that, go to Reports > Employee data > Terminated employees. There you will see a list of terminated employees, ordered by termination date. Clicking on employee's name will open his profile - from there you can access time off details or any documents which were added for this employee.